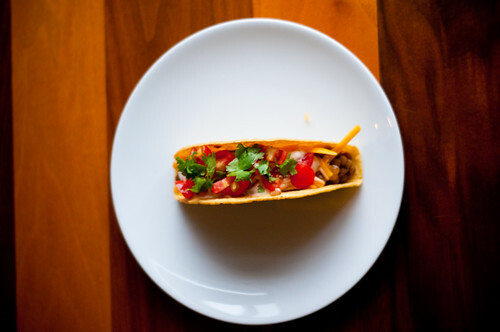 I'm not sure why it is, but there's something about the combination of a crunchy shell, spicy filling, rich cheese, and bright notes of cilantro that just call to my soul. You can cobble together pretty much anything vaguely Mexican/South American/Tex-Mex/South-Western, and I will probably like it. 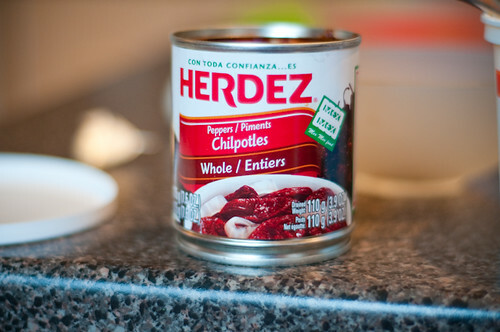 I grew up with Old El Paso Taco kits (as I'm sure did a large portion of my readership...if not, you can read about them here - essentially a box containing taco shells, taco mix and some sort of taco sauce. Just add meat, lettuce and cheese and voila.). I liked them as a kid, but when I was a teenager, our family discovered fajitas, and frankly, there was no looking back. We raced ahead with our soft tortillas, grilled chicken and steak, and the lowly crunchy taco of our youth was forgotten in some cobweb-ridden corner of our minds. Ever the nutritionally obsessed, I actually always thought that the soft shells were better for you than the tantalizingly crispy hard corn shells. (For my American readers, you have to understand that corn tortillas are few and far between in most parts of Canada). In recent years, I've made sure that my shells were 100% whole grain, usually opting for the Dempsters Ancient Grains type. A small tortilla (7 inches - you know you're going to eat at least two!) has about 100 calories, and features such stellar ingredients as whole wheat flour, flax, millet, spelt, kamut, barley, etc. It also features such not-so-stellar ingredients as glucose-fructose (that's Canadian for high-fructose corn syrup), sodium acid pyrophosphate, potassium sorbate, sodium propionate, monoglyceries, sodium stearoyl-2-lactylate, fumaric acid, cellulose gum, carrageenan, maltodextrin. And maybe sulfites. Even if most of those ingredients aren't actually BAD, I just don't think so many ingredients are NECESSARY. I like shorter ingredient lists, most because I feel the food is then closer to what I could make at home. :) They also have 230 mg of sodium, so if you eat two (and seriously, you will), you've got 520 mg of sodium before you've even put anything in your fajita. So I decided to go for a blast from the past (for me, at least) and try out hard taco shells. I was pleasantly surprised by a few things...first, the ingredient list was relatively short - corn flour, palm oil, salt, water and calcium hydroxide. Even though there is palm oil, two stand n stuff shells (bigger than classic shells) have 130 calories, 6 g fat (2.5 g sat fat), 115 mg of sodium and 1 g fibre. The soft tortillas do getter on fibre and a bit better on fat, but 130 calories vs. 200 calories, and 115 mg sodium vs. 520 mg sodium...this makes the shells a solid contender. They certainly aren't any hard-core sort of health food, but they certainly aren't too bad either. I'm in. Especially when you fill them with the most delicious filling of spiced lentils. Yes, I realize this is madness. 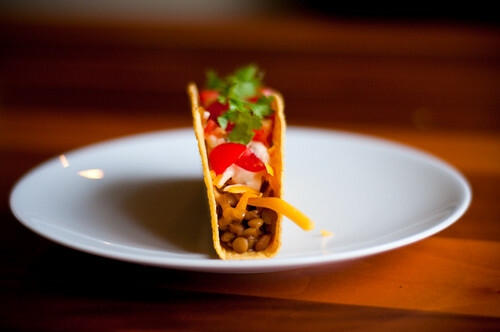 Do lentils really belong in tacos? Can they really hold their own against the meaty deliciousness of seasoned ground beef? And surprisingly....they can. YUM. If you've a hankering for something meatless and wonderful, this meal is perfect. 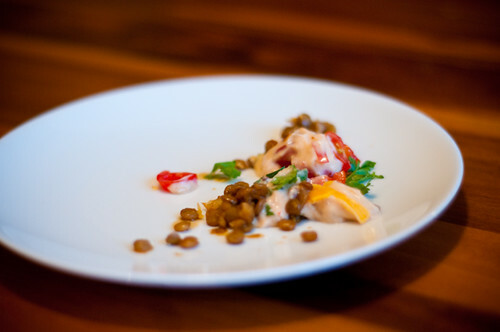 THe lentils are warm and delicious, and the spicy chipotle sour cream is the perfect creamy yet spicy foil. I've modified the recipe quite a bit from the epicurious original, but I think the end result is pretty darn delicious. ***What to do with leftover chipotle in adobo (which, unless you are a sword-swallowing fire-breather, you probably cannot down in one sitting)? 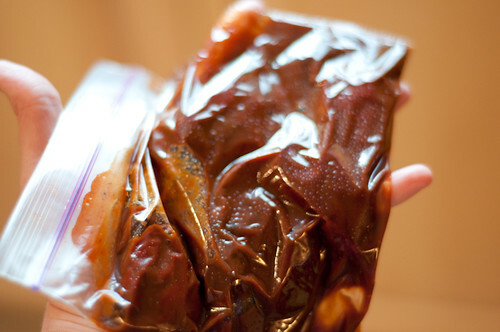 I dump the contents of can into a freezer bag, and freeze it all flattened out. Next time you make this recipe (cuz there will, naturally, be a next time), just break off a pepper and off you go! 1. Heat oil in large skillet over medium-high heat. 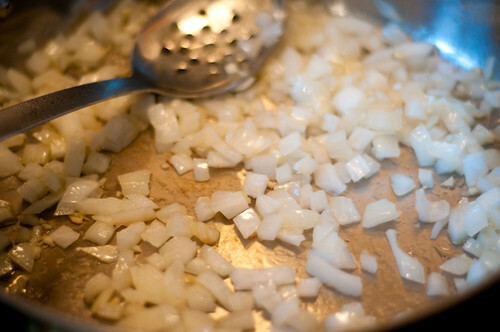 Cook onion, garlic and salt until onion begins to soften, 3 to 4 minutes. 2. Add lentils and spices. Cook until spices are fragrant and lentils are dry, about 1 minute. Add water; bring to a boil. 3. 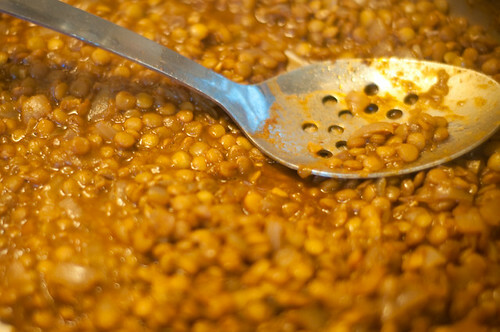 Reduce heat, cover and simmer until lentils are tender, 25 to 30 minutes. 4. 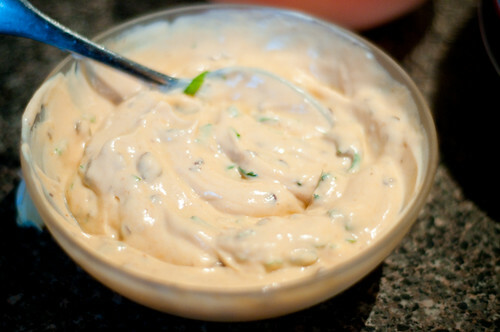 Meanwhile, Mix sour cream, chile and adobo sauce in a bowl. 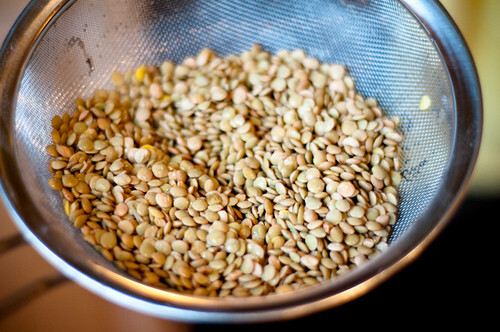 Uncover lentils and cook until mixture thickens, 6 to 8 minutes. 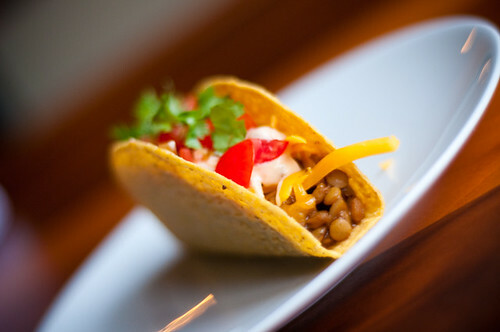 Spoon 1/4 cup lentil mixture into each taco shell (my taco shells needed 5 minutes in a 350F oven. Check the label on yours to see if they do too!). Top with 2 heaping teaspoons sour cream mixture, greens, tomato and cheese. Stick with the normal shells - less mess, fewer calories. And as long as you don't go running around taking pictures of your dinner like a crazy person food blogger, you should be fine. After dinner, I made the most random cake recipe. 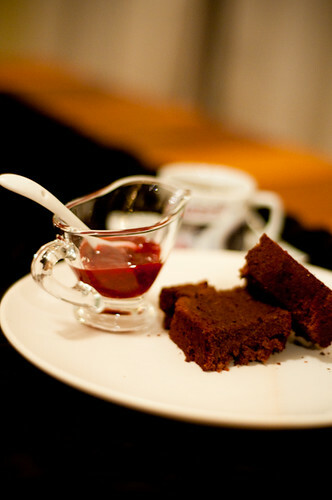 I came across this chocolate chickpea cake recipe while browsing on Serious Eats (SUCH an awesome site). It was just so weird....chickpeas, chocolate, no flour, no oil...how could this be possible? And I'm no stranger to incorporating legumes into my baking (witness: the bean cookie) This was just too weird not to make. Even better, I actually had all the ingredients on hand (hubs tucked some yummy 85% dark chocolate from Laura Secord into my Mother's Day gift...smart, smart man). The cake is uber easy to throw together. 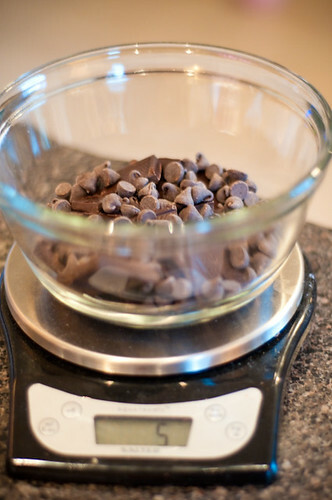 Melt the chocolate in the microwave, and whizz the rest of the ingredients through the food processor. The best part was not having to use flour...I swear, every single time I take out my flour, it's like some evil little flour gnome has run up inside and carefully placed a whole bunch in the rolled-up top of the bag, just perfectly positioned to explode onto my [black] counter top in a white, powdery testament to my kitchen failures. Meh. This was so easy. I baked the recipe for 50 minutes instead of 60 (though my oven was on convection). I think I'd check it at 45 minutes next time. Also, because I had no butter and was too lazy to 'flour' my pan with cocoa [relying instead on a brush of canola oil] my cake stuck a bit. You could eliminate this problem entirely by baking in a parchment paper lining. Alas, I was too lazy. The results are a really delicious chocolate loaf...I wouldn't serve it for dessert on its own, I don't think (although topped with ice cream and chocolate sauce, with raspberry coulis, it would probably pretty fantastic). It's a great nibbling cake. 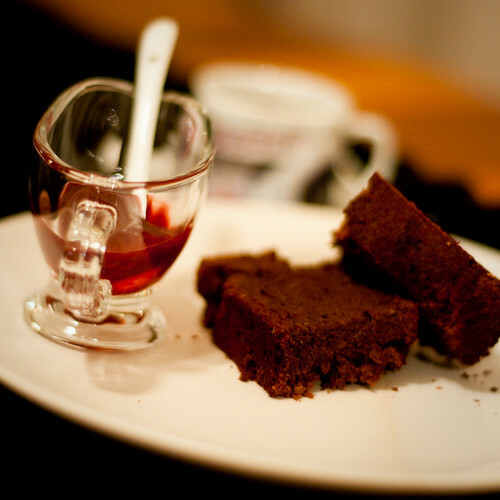 The chocolate flavour (from mostly 85% cocoa, with a small handful of chips and one small square of 70%) is rich and deep and the cake is not too sweet. It lacks the soft squishy richness of a classic shortening/white flour loaf, but I don't think that's a bad thing. 1. Adjust oven rack to middle position and preheat oven to 350°F. 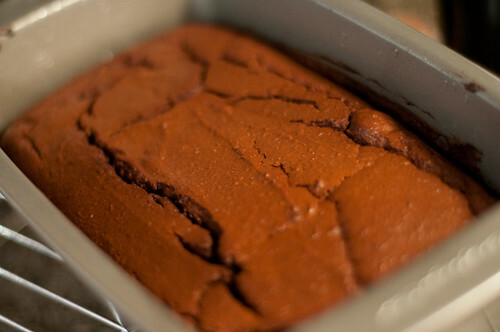 Grease interior of 1 pound loaf pan with flour, then dust all surfaces with cocoa, tapping out extra. 2. In a large microwave-safe bowl, melt chocolate by microwaving in 45-second intervals, at 50% power, stirring with a rubber spatula each time until melted. Alternatively, heat, stirring constantly, over double boiler until melted. 3. Puree beans, eggs and vanilla in a food processor (or using an immersion blender) until smooth, about 1 minute. 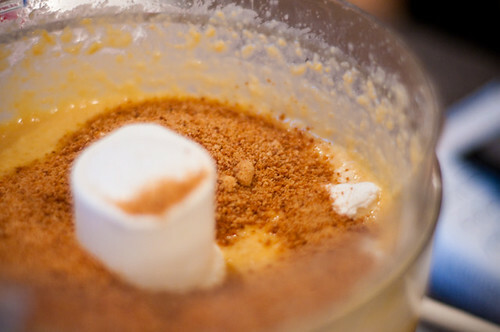 Add sugar, baking powder and salt and blend to combine, about 20 seconds. 4. Add melted chocolate and blend to combine, scraping down sides of bowl well as necessary. 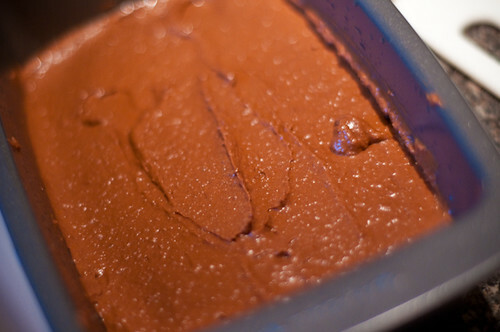 Batter will have a thick, pudding-like consistency. Transfer batter into prepared pan and bake until knife inserted in center comes out clean, about 45 minutes. 5. 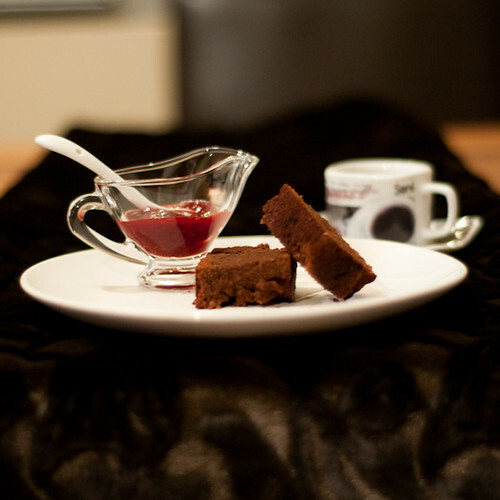 Allow cake to cool for 15 minutes on wire cooling rack before inverting onto serving platter. Cool completely. Dust with confectioner's sugar just before serving. Mine only stuck a little bit! (this is an achievement for me). Thanks for reading! If you're interested in more meatless monday ideas, check out the Meatless Monday website. I'm not sure I can mess with a good thing (to me, a good chocolate cake is worth the extra calories) but you have definitely inspired me to try out the tacos next meatless Monday! Thank you! This looks awesome! I will definitely try both of these recipes. OMG this looks so good. Coming from a Latino background I can certainly appreciate this meal. Make it your own by adding some low fat/low sodium options.